Part of a big format change from the previous year, 2016-17 SPx Hockey is now issued as a four-card box. Every box includes at least one autograph, one relic and one technology card as well as one more hit from that trio of choices. Intended to bring premium cards at a lower pack price, 2016-17 SPx Hockey still pays special attention to the new rookie class. This includes base Shadow Box Rookies cards, numbered to 249, as well as Red Materials (#/149), Blue Autograph (#/199) and Gold Autograph Patch (#/99) versions. Base Stars and Legends are part of the "technology" cards and each are numbered to 149. They also offer a similar mix of parallels as the rookies. 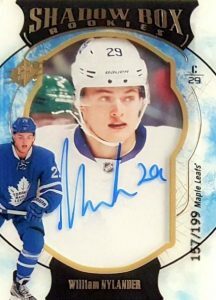 Other signed cards include Impressions Autographs (#/199 or less) with an artistic background and White Out Autographs (1:20 packs) that, understandably, opts for a white-heavy design. Flipping that theme, Black Out Autographs (#/10) are the limited parallel version. Among several rookie hits in 2016-17 SPx Hockey are SPx Rookies (#/399) with the key first-year players found in Red Jersey (#/235), along with Blue Autograph (#/165 or less, Orange Patch (#/15), Gold Autograph Patch (#/99 or less) and Autograph Tag (#/5) parallels. 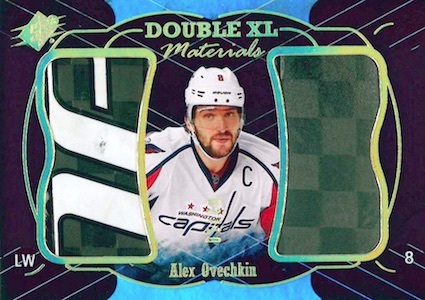 Double XL Materials, Double XL Duos Materials, Extravagant Materials (1:30 packs), Extraordinary Materials, and dual relic Ice Shredders are some of the memorabilia inserts in the product. Each of these is also found in several limited parallels such as Premium Black. 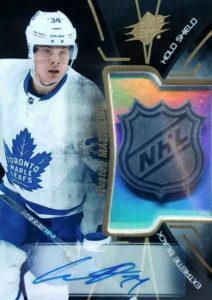 Also falling under the "technology" classification, Extreme Black Holo Shield showcases a 3D holographic NHL shield logo with subsets for Stars, Legends and Rookies. Autograph parallels for these are exclusive to physical hobby boxes. The majority of 2016-17 SPx Hockey will also be featured as an ePack offering. 75 cards. Shop base cards on eBay. Stars and Legends - #/149; Shadow Box Rookies - #/249. 65 cards. Specific group odds noted below. Shop cards on eBay. Stars Overall Odds - 1:16 hobby/ePacks. Legends Overall Odds* - 1:160 hobby/ePacks. Shadow Box Rookies - #/149. 42 cards. Shop cards on eBay. PARALLEL CARDS: Black Premium Material Autographs #/5*. 50 cards. Serial Numbered #/399. Shop on eBay. 47 cards. Serial Numbered #/235. Shop on eBay. PARALLEL CARDS: Orange Patch #/15. 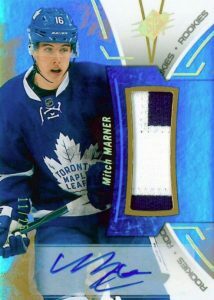 PARALLEL CARDS: Gold Patch #/99 (Marner/Matthews - #/25), Black Tag #/5*. Stars Overall Odds - 1:80 hobby/ePacks. Legends Overall Odds - 1:400 hobby/ePacks. Rookies Overall Odds - 1:100 hobby/ePacks. 47 cards. Hobby Only. Specific group odds noted below. Shop on eBay. Stars Overall Odds - 1:100 hobby. Legends Overall Odds - 1:1,000 hobby. Rookies Overall Odds - 1:100 hobby. PARALLEL CARDS: Premium Black #/15 or #/10. 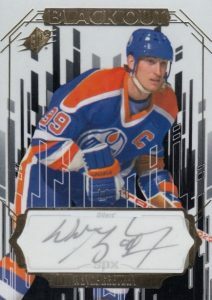 PARALLEL CARDS: Premium Black #/15 (Lemieux/Gretzky - #/10). 18 cards. Overall odds: 1:30 Hobby/ePacks. Shop on eBay. PARALLEL CARDS: Premium Black #/25. 19 cards. Specific group odds noted below. Shop on eBay. Rookies Overall Odds - 1:100. Stars Overall Odds - 1:40 hobby/ePacks. PARALLEL CARDS: Premium Black #/25 or #/15. 26 cards. Overall odds: 1:20 Hobby and ePacks. Shop on eBay. 27 cards. Serial Numbered #/10. Shop on eBay. Download the spreadsheet version of the 2016-17 SPx Hockey checklist. Jammer � It was expressly stated that boxes contain four packs, each with just one card. Base cards count as one of the “technology” inserts. UD’s choice to release more and more products on ePack is why I give this and other ePack related products a low rating. 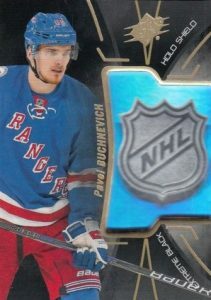 Just like UD1, UD2, OPC Platinum, SPGU and now SPx is going to be released on ePack this year. February 22 is what we are still hearing. Having the checklist out now is a pretty good sign but you never know. Thanks again UD, you saved my wallet once again. Btw, Tryamkin played in the latter part of 15-16 season and most of 16-17 and still you don’t make a rookie card in this, the 11th set for this season. Tryamkin has played more NHL games than Fasching, Kapanen, Milano, Bailey, Santini, Dickinson, Connor, Barzal, and Sergachev. Granted some of those are high draft picks but not all. 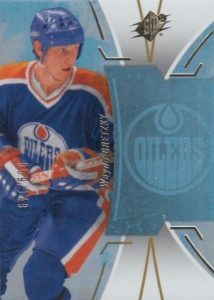 One card that does interest me is Igor Larionov in a Canucks jersey. Come on guys! You can not hate on a product just b/c of one thing. I am not a fan of epacks either, but does that make every product terrible? Of course not. Epacks are for those collectors that do not have access to a hobby shop, so it works for them. Look at a product for what it is and UD is trying to make products better and SPX looks like a huge improvement for years past. Period! This is way worse than any spx. 4 total cards. Where are all the legends. I’ve bought 1 box of series 1 this year spent a total of 100 bucks. I was a 10000+ a year buyer but when crap like this is put out I’ll save my money thanks. Just when you think it couldn’t get worse they put out this. Bring back panini or even topps. It’s turned in to a breakers and rich old mans hobby. My wallet just got a little thicker. look at the base red stars and legends.. not numbered…. I repeat what the other guy said…. Pretty soon it’s going back to 36 packs per box, base and rookies and a chance of an auto. For $59 bucks. This high end, repetitive G U junk is dead. Cards look much better than past years, however, once again UD is lacking in conceptual ideas and provides little value! Again with the silver NHL logo idea, again with Shadow Box (though these look nice.) Not nearly enough retired content or current star level players. 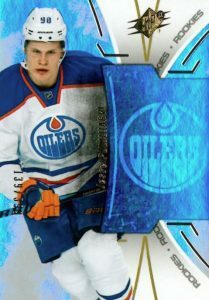 Nice to finally see a McDavid card with “C” on his jersey in this set. First ones of the 2016-17 season. The checklist doesn’t cover all the teams. There so many teams without a rookie or with just only one. The serial numbers are too high for a High-End product. As someone before me underlined, it’s so hard to hit a #/99 card. I don’t understand either when they put redundant subsets. In every High-End product there are 3-4 jersey subsets. 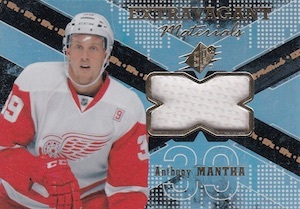 They change a bit the design of the card, but it’s still a jersey card: Red Jersey, Extraordinary Materials, Ice Shreders, Extravagant Materials…Just make 3 materials sets. Two with jerseys and one with patches and that’s it. The design is awesome though. The shadow boxes are fine. Not new though, because you can find this in The Cup and Ice. I really loved the White Out and Black Out autos. Superbe design for those. The price? Well, the price is not extremely high if you ask me. This seems a decent collection. I’ve seen much worse. 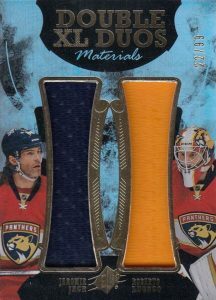 The problem with hockey products is that established collections such as Series 1 and 2, Artifacts, SP Authentic, will attract much more customers who pay more money for cards less difficult to find. Even if it’s a High-End, since it’s a refurbished product and since people complain a lot about it, the prices for singles go very low comparing to the prices payed for sealed boxes. And that’s obvious since people will start to sell rookies for 2-3$ even though the average cost for a card in this set is 25-30$. This is not a high end product. Should have made the auto shadowbox rookies in the base set. As always too much fluff like the /399 rookie inserts. 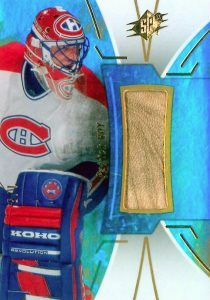 I like some aspects of the design, but the /99 patch auto shadowboxes have a weird auto design. It looks like the card with the patch is 1 layer that they added 1 layer of acetate to which was signed by the player, then another layer of acetate with the card design. 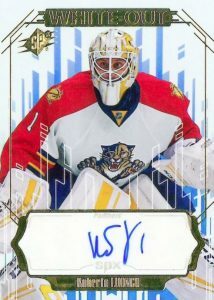 So the auto graph can be obscured by the top design of the card showing goofy looking autos. P.s. are you going to post the excel version of the checklist? It’s posted at the bottom of the checklist. A lot of the boxes I saw had 2 or 3 base cards which is unacceptable for a 4 card box. Again UD is downsizing to 4 packs and the customer is the big loser.Anyway i’m done with wax gonna buy singles from Ebay from now on. This years product is a bit underwhelming. The card it’s self is boring with some of them having some shine to them, but not much else. The auto cards are ok at best, the Patch card are only good if it has extra color. 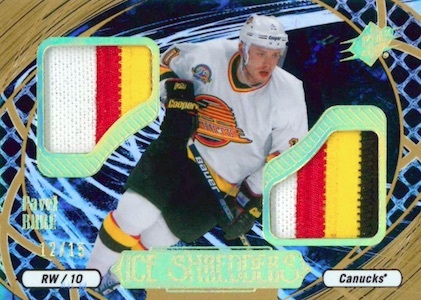 The 2015/16 SPX had far better color scheme, and using the 4 little patches/Jersey to create a somewhat of an X type pattern with gold around them. Showing an auto on a stick like area is creative, Not to mention you get only 4 cards in a box vs 40 cards in last years, all you did is down grade the auto/patch cards this year and exchanged the base cards from last year to one technology card. In closing, I would have used the same exact pattern from last year instead of what you guys choose for this year. 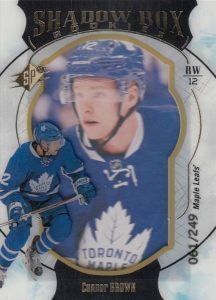 It shows that upper deck either lacks the consistencies to be creative or is all about the buck and is using a cheaper color scheme, both of which doesn’t look good. Last year I bought at least 5 to 6 boxes of this product, however, will not even entertain one box. I hope this message gets to the appropriate person. Thank you and have a great day. UD finally decided to make their products for group breakers only! This is a pseudo high end product which delivers absolutely no value in return (not because of epack). It’s just 4 cards per box and you’ll most likely end up with a sticker autograph and a one colored jersey. 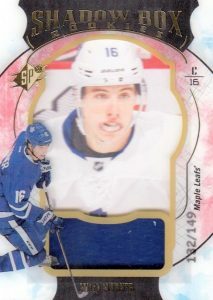 If you’re in it for the Shadowboxes, just get the ones you likes from the bay (even Matthews and Laine are affordable). If you expect to hit something for your PC you’ll need a lot of luck, as this product is so watered with all those rookie parallels and subsets and filled up with a few veterans and almost no legends. I’ve seen also many quality issues with foils and corners. I’ll stay away from SPx after I’ve seen several case breaks breaks and I wonder for how long group breakers will support such a terrible products. 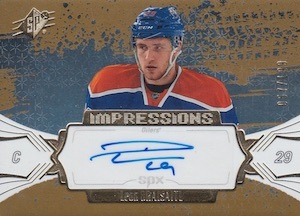 It says on here that the Black Impressions autos are #’d to 5, I pulled a black variation John Gibson and it was #’d to 3?! Anyone know why this is? Opened a box. Cost around 150 canadian, value of cards 40-75$. Got one of the top tier shadowboxes with the patch auto, got a 1 of 15 orange parallel patch rookie, and two non-numbered cards. If either of the rookies was the right guy I would’ve had something, so can’t say it’s the worst.